Ben There, Dan That is a comedy adventure game that was originally released as freeware, but a commercial version is available that includes graphical enhancements and a full soundtrack. It was created as an homage to classic adventure games, but has become a cult classic on its own. 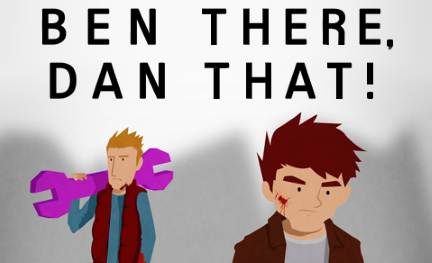 The game follows two British gamers, Ben and Dan, who are kidnapped by aliens and have to find their way back home by following doors through time until they find the correct door that leads back to their apartment. The game is quite funny, with very twisted humor and many homages to classic adventure games thrown in the mix. It can push the boundaries of taste a bit, but if jokes about subjects such as death and dismemberment don't bother you, this game has a lot going for it. The game has a simple, but pleasing, art style. Both versions have simplistic backgrounds and character art and animation, but the commercial version improves upon the art of the original, and has a more readable font that comes from the game's sequel. The commercial version also has a full soundtrack, with a jazzy sound that really helps to set the mood of the game. The puzzles are just as twisted as the game's humor, and there are some really clever ones to be found here. Some of them go beyond the realm of real world logic, but they fit within the logic of the game's world quite well. Ben There, Dan That is a game full of dark humor that is well worth playing if that style of humor sits well with you. It's art style is simplistic, but what it lacks in sophistication it makes up for in charm. That's a good slogan for the entire game, actually. It's a short game, and it's humor is juvenile, as is it's overall story, but it manages to overcome it's shortcomings with excellent puzzle design and a great soundtrack in the commercial version. Ultimately, it's a game that is worth playing.